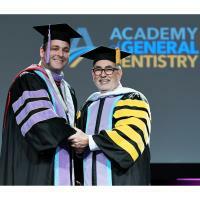 PORTSMOUTH - John Fitzsimons, DMD, a dentist at Families First Dental Center in Portsmouth, received the Fellowship Award from the Academy of General Dentistry (AGD) on June 9 in New Orleans. The award recognizes THE AGD member’s commitment to excellence in dental education. The Fellowship Award is presented to dentists looking to provide the highest quality of dental care by remaining current in their profession. In order to receive this award, Dr. Fitzsimons completed 500 hours of continuing dental education, passed a comprehensive written exam and fulfilled three years of continuing membership with the AGD. As the Academy said in a written statement, the 17,000 AGD Fellows “understand that great smiles and good oral health for their patients are the result of going above and beyond basic requirements. The Fellowship Award symbolizes excellence in the dental profession and a commitment to providing exceptional patient care.” It honors dentists for their “commitment to continuing education and dedication to providing patients with advanced and exceptional oral health care,” says AGD President Manuel A. Cordero, DDS, CPH, MAGD. Dr. Fitzsimons graduated from Boston University in 2011. In addition to the AGD, Dr. Fitzsimons is a member of the American Dental Association, New Hampshire Dental Society, and the Southeast New Hampshire Dental Society. Families First Dental Center provides preventive, restorative and emergent dental care to people of all ages and income levels, both insured and uninsured. For information, call (603) 422-8208 ext. 3, or visit FamiliesFirstSeacoast.org.